Jay Egenes (pronounced Egg’-uh-ness) is a musician, a lawyer, and, now, a pastor. Several years ago, people in a Bible study he was leading starting asking him “Why aren’t you a pastor?” After spending time in prayer and discussion with his family, Pastor Jay left his law practice and took a part time position at a church in Riverside while preparing for full-time ministry. His preaching/teaching style focuses on understanding a biblical text, to see how it reveals the love of Jesus for us—for you. This in turn, inspires us to love Jesus and to love reading the Bible so that we can get to know Jesus better, experiencing and reflecting His love in our lives. Pastor Jay studied political science and philosophy at Luther College and got his law degree at University of Iowa. He has lived in southern California since 1988, and practiced law in Riverside and San Bernardino before entering full-time ministry. He studied theology at Fuller Theological Seminary (a large non-denominational seminary that also trains missionaries) and at Pacific Lutheran Theological Seminary. Before practicing law, Jay worked as a professional musician. You can still ocassionally catch him playing harmonica at a local blues jam or guitar at an open mic. Pastor Jay and his late wife Gail have three grown daughters, Anna, who teaches high school and serves as Spirit of Hope's worship leader; Kirsten, an actress who lives in New York City; and Erica, an attorney who also lives in New York. 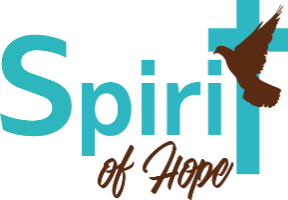 Paula has worshipped with Spirit of Hope since 1999 and was recently hired as Church Administrator. She has been married to Sam Gonzales for 33 years. Together they have 3 boys, a “daughter”, 8 grandkids who are the light of her world, and 10 grown God-Children. Anna Egenes Hightower teaches theater at North High School in Riverside, teaches vocal music with Riverside Children's Theater, serves on the board of Junior University, and serves as the worship leader at Spirit of Hope. She has a degree in Musical Theater Directing from Boston Conservatory. Anna and her husband Ryan have one son, Beckett.